In a nutshell: The Sony Xperia X Compact is a high-end compact smartphone with a fast processor, outstanding camera and plenty of memory. 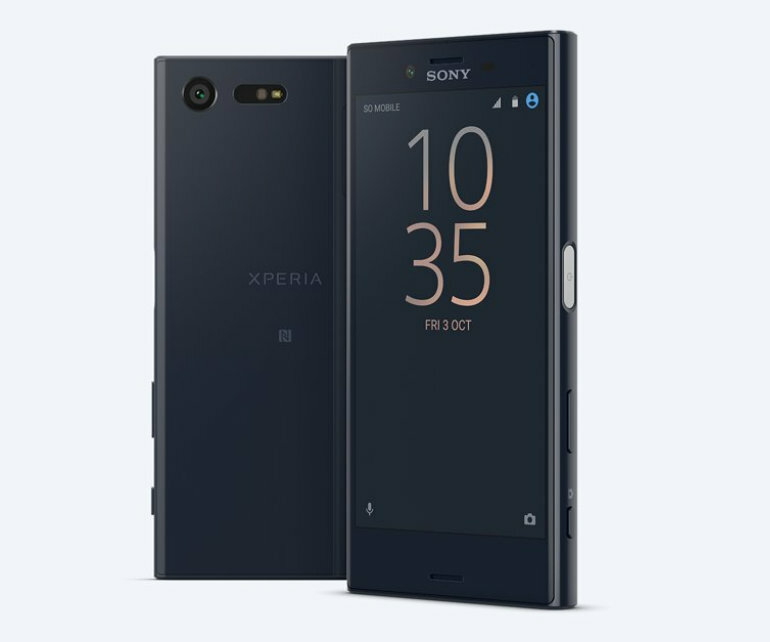 Lightweight and easily pocketable, it offers most of the features of Sony's flagship devices. However there are a few compromises and it seems over-priced compared with the alternatives. While most attention goes to the biggest, bestest phones, there's always a demand for a phone that's more compact than the big beasts but doesn't cut corners on power. Sony has traditionally catered well for that market, and the Xperia X Compact is its latest product to fill the niche. The X Compact is a good-sized phone - narrower and shorter than the Xperia X, but a little thicker. It's the kind of phone you can use single-handedly, unless you have smaller than average hands. It's lighter too, although at 135g it's a fair bit heavier than the Apple iPhone SE. The design is clearly modelled on the full-size Xperia X, but instead of a metal finish, the X Compact has a gloss plastic rear, which isn't what we're expecting to see in a phone as expensive as this. The power button on the edge incorporates an integrated fingerprint sensor. The phone is available in a choice of Black, White or Mist Blue. The screen is smaller than the Xperia X, at 4.6 inches. The screen resolution has been reduced too, down to 1280 x 720 pixels. It's a decent screen, but it lacks the sharpness, brightness and clarity of the best high-end displays. Inside, the X Compact retains most of the same tech as its big brother. That means a fast Snapdragon 650 processor with 6 cores, plus 3GB of RAM. It's not quite as fast as the fastest, but it's not far behind and shouldn't cause any lag. The phone has 32GB of onboard memory, and you can add a microSD card for up to 256GB extra storage. The Xperia X Compact keeps the impressive 23 megapixel rear camera of the Xperia X, but substitutes a lower-spec front camera. The main camera is equipped with a 23 megapixel Exmor RS sensor, Sony’s award-winning 24mm G Lens, and a very fast and accurate predictive hybrid autofocus system, making it a good choice for action shots. HDR is available, and the camera performs well in low light. It can also record video at 1080p resolution, with 5-axis stabilisation to minimise camera shake. The front camera has a 5 megapixel Exmor R sensor. It's not as good as the main camera, but performs well enough except in low light situations, where images can be noisy. The X Compact has the same full set of connectivity options as the X. It's a category 6 LTE 4G phone, with Wi-Fi, Miracast, Google Cast, NFC, Bluetooth 4.2, and GPS/GLONASS. It also comes with USB and, of course, a 3.5mm headphone jack. The battery life of the original Xperia X didn't impress us greatly. The X Compact has a fractionally larger battery than the Xperia X, and with a lower resolution screen but the rest of the hardware substantially the same, we'd expect to squeeze perhaps an extra hour of use before the battery dies. Sony claims a two-day battery life for the Xperia X Compact, but we're not convinced. The Xperia X Compact is a good phone for anyone looking for a pocket-sized device that can be used with one hand. It retains most of the performance of a flagship phone, and costs almost as much, but there are a few compromises. It's a pity that Sony has swapped the metal body of the X for a glossy plastic shell in the X Compact. For a phone that costs nearly £30 per month on Pay Monthly, it looks cheap. The front camera has been downgraded too, and the screen isn't the best. But it's a fast phone with plenty of memory, and the rear camera is outstanding. We're not certain that the X Compact offers an improvement over the Sony Z5 Compact from last year. It's more expensive than the iPhone SE, although it has a better screen, camera and more memory. Overall it's a good phone, but over-priced. Charged to 100%, five hours later still at 93%, call quality is outstanding. Camera is overall good, but do you really need 4k video recording, I can do without it. Got it from the CEX for £220,grade a although on Vodafone, no need for a two year contract. Make sure you get a tempered glass protection. Although not pleased the water resistant features were dropped. I recommend it if you want something compact and don't bother with games.